(Nov. 3, 2016) - The Portland Bureau of Transportation and Portland Police Bureau announced the results of a crosswalk safety education and enforcement action that took place on Thursday, October 27 from 10:30 to 11:30 a.m. at the marked crossing at SW 40th and Huber to raise awareness of pedestrian safety and Oregon traffic laws. 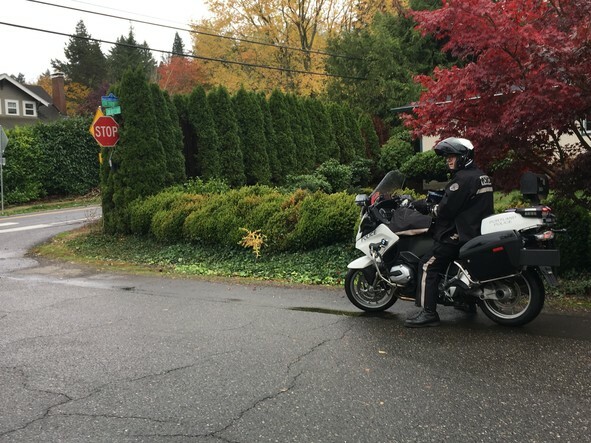 Portland Police watch for traffic violations at the November 3 crosswalk education and enforcement action at SW 40th and Huber. Each crosswalk enforcement action involves a designated pedestrian crossing at a marked or unmarked crosswalk while police monitor how people driving, bicycling and walking adhere to traffic safety laws. Drivers who fail to stop for pedestrians in the crosswalk and pedestrians who fail to follow Oregon traffic laws may be issued a warning or citation. A PBOT staff person served as the designated pedestrian crossing the street during the action.